During 2007, Sadia Mesuna, 6, spent two months at a Guinea worm containment center in Ghana after an outbreak of the disease in her hometown of Savelugu, in the Northern Region. She was in agony as three Guinea worms emerged from her feet. "It was very painful, especially when they were dressing my wounds," Sadia said. "It feels more painful than stepping on fire coals or being cut. And you don't feel like eating anything." During her time at the containment center, Sadia was visited by former U.S. President Jimmy Carter and former First Lady Rosalynn Carter. "Rosalynn and I first met Sadia when she was in the midst of Guinea worm's worst stage. Separated from her family for two months at a Guinea worm containment center, she was waiting for the worms to complete their slow, painful exit from her foot," President Carter said. "I held her hand that day, trying to comfort her as best I could while community health workers did their daily work of easing the three worms out just a bit more and changing her dressings," he added. "I could only marvel at the bravery she showed, despite her tears." "Whenever I look at the most recent photo of Sadia Mesuna's face," President Carter said, "this little girl's agonies of Guinea worm are now only a memory. It's what a 6-year-old's face is supposed to look like--serene, with the natural confidence that comes from being able to live without fear." "To see Sadia's face today and to know she will never have to endure that ordeal again, is especially moving for me," he added. When The Carter Center began leading the campaign to eradicate Guinea worm in 1986, there were 3.5 million cases of the disease in 20 countries in Africa and Asia. Today, there are fewer than 5,000 cases in six African countries-Sudan, Ghana, Nigeria, Ethiopia, Niger, Mali. Sadia's story of triumph over Guinea worm disease reflects the Carter Center's commitment to eradication of the "forgotten disease of forgotten people." Learning the cause of her disease and changing her behavior has led to a return to health for the young girl. "I'll only drink filtered water from now on," vowed Sadia. 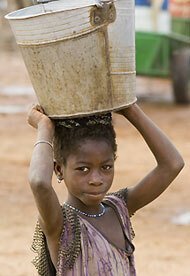 Sadia in 2008, fetching water and living the life of a normal, Guinea worm-free, child. Former U.S. President Jimmy Carter greets Sadia Mesuna in 2007 as she rests between Guinea worm extractions.